The big day is just around the corner and while it’s often a joyous and fun season for us humans, it can also be a stressful and dangerous time of year for our canine companions. Make a safe space - Sometimes the best way to help your dog relax is by taking them out of the situation that’s causing him stress and putting him in a safe, comfortable space. For some dogs, this might mean being locked in a crate with a soft blanket and a toy. For other dogs, shutting them in a quiet room with a cosy place to sleep is also a good option. That’s right−there is nothing wrong with letting them sit the whole thing out. Check your own energy - Dogs are fantastic at picking up on our energy. If you’re stressed out and anxious (visiting family can be the cause of this), it’s likely that your dog will also become stressed out and anxious. Relax, do some deep breathing exercises, and you will see the difference. One of the best parts of the holidays is the food (and the amount of it too). That being said, there are so many things that we eat during the holidays that are dangerous for dogs. Not only could many holiday foods make your dog very sick, but certain foods are lethal. Avoid these ingredients and maybe find a safer alternative. There are dog chocolates and biscuits available that they will still love. Poinsettias - the chemicals in a poinsettia plant cause mouth and throat irritation, along with upset stomach and vomiting. When consumed in large quantities, these plants are lethal to dogs. 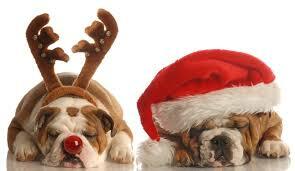 Holly Plants - Holly, when ingested, can cause pets to suffer nausea, vomiting, and diarrhoea. Mistletoe - Mistletoe can cause gastrointestinal upset and cardiovascular problems. There are also varieties of mistletoe that can cause kidney failure if ingested. 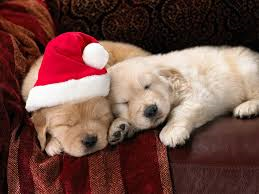 Christmas Trees (Pine Trees) - Christmas trees themselves are perfectly safe for pets. However, if you water your tree, this is where they get dangerous. Tree water often collects bacteria and can cause your dog to have an upset stomach and diarrhoea. If you have a tree, just make sure your dog can’t reach the water the tree sits in. Always remember, if you have a dog that is a chewer, the easiest approach to get them to stop that unwanted behaviour is to redirect them onto something they are allowed to chew or putting them somewhere safe rather than trying to stop the chewing completely. Twinkling lights, scented candles, and sparkly tinsel are all lovely and help to make the holiday season truly festive. However, it is a very good idea to use caution when putting out your decorations. Candles: Naked flames at swishy dog tail height are obviously something to be avoided. One accident and your pooch could accidently set your house on fire. For those of you that love candles and don’t want to go without them, be sure to place them on high places, like a kitchen table or mantelpiece where they can’t get knocked over. You can also purchase flameless candles at the store which are a safe option. 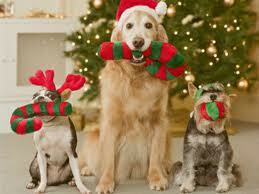 Tinsel: As for tinsel, if you have a dog who likes to taste test your decor, stay far away from this shiny decoration. Tinsel comes in long, plastic strands which can easily get caught going through your dog’s digestive tract if ingested, This can cause internal blockages, organ damage, and worse. Lights: Most dogs won’t bother a strand of lights. That being said, some dogs - especially puppies - have been known to chew on sets of lights that plug into the wall. If you have a puppy or dog that loves to chew, make sure your light strands are off the ground where they can’t be reached. 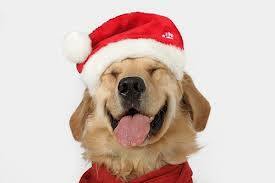 Many dogs receive gifts during the holidays; there’s certainly nothing wrong with that. However, it is important that you monitor what your dog is unwrapping. Every year there is TV report on toys that are dangerous to small children; either they have small parts that can come off easily and be a choking hazard, or they can catch fire too easily. With dogs, it’s the same as having a small child. 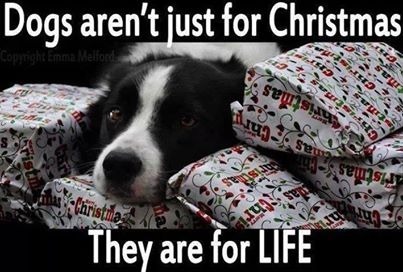 A lot of times, people think they are doing something nice by buying your pet a gift. 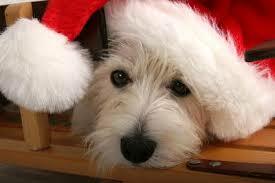 But, unfortunately, the gifts dogs receive aren’t always healthy or safe. Always check the labels and make sure that any components such as paint on chew toys are safe if swallowed.